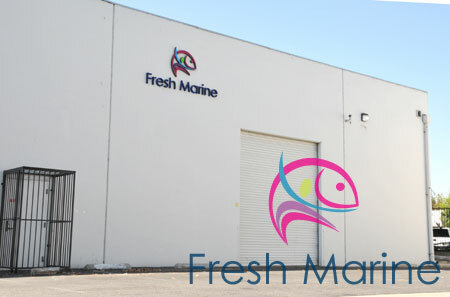 Home > Popular Category > Customer Center > Welcome to FreshMarine.com! FreshMarine.com mission is to provide you with a low-cost source of top-quality marine fish, corals, live rock and sand, invertebrates and live plants all at great prices. Those of you that we serve will have the opportunity to receive fresh livestock fish in healthy condition. Livestock orders are packed with care, expertise, and confidence. Therefore, the fish you recieve will look happy and healthy. For corals and live rock, it is healthy and free of unwanted pests like bristle worms, aiptasia anemones and mantis shrimps. Our mission is to be the #1 Saltwater Fish and Reef Aquarist retailer. We value your business great and we do our best to honor any requests you might have. It�s easy to see why we�re passionate about our business and take such pleasure in pleasing you. 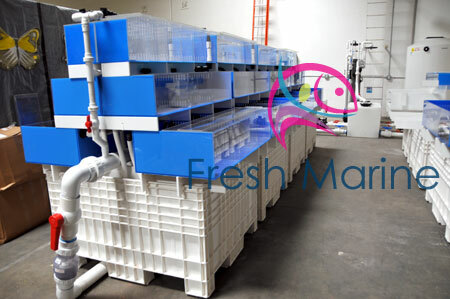 If you follow FreshMarine.com's Acclimation Procedure you will find your success in keeping your livestock alive. It is very important you follow the step-by-step Acclimation Procedure. This method allows for the fish, coral, or invertebrate to adjust to your aquarium parameters at a pace that is acceptable for that particular animal. Not only do we want to ensure the best health for your fish, we want you and your family to enjoy the new additions to your living aquarium for as long as possible. As we are settling into a new 5000 square feet facility this are some of the recent photo of our dedicated Fish Holding System! Beautifying your home with a marine aquarium is trickier job than it appears, as it requires dedication, patience, and above all, guidance. 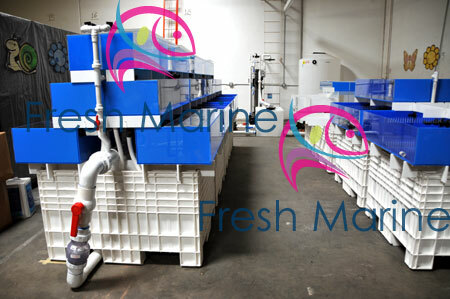 Whether you are new to the world of marine aquariums or a pro, FreshMarine.com is the answer to all your requirements. We assure you of the health and quality of our marine fish, invertebrates, corals, aquatic plants, and our other live aquarium supplies. Our carefully chosen stuff, kept in healthy environment and stringent checks, backed by state-of-art infrastructure gives us the confidence to extend the 5-day Alive Arrive Guarantee to all our customers! Similarly, our live rocks and corals are always free of any harmful elements and pests, such as aiptasia anemones, bristle worms, and mantis shrimps. In addition to our products and support systems, we also give you the guidance to setup and maintain your marine aquarium in the best possible way. Our �Acclimation Procedure� is developed in-house to help our customers in familiarizing their newly introduced livestock to their home aquarium settings. FreshMarine has come up with its new Aquaculture Coral & Marine Life Facility in California, which spreads over a vast area of 5,000 square feet. The cumulative size of the facility is 3,000 gallons of saltwater across different sub-systems. The entire setup is supported by 24x7x365 power backup. An external generator, based upon Natural Gas fuel, powers all the return pumps installed at various points throughout the unit. To maintain most hygienic aquatic surroundings for our marine animals (fish and invertebrates), plants, corals, and live rock, we have employed the best water filtration technologies available in the market. Our facility is equipped with the RK2 Filtration Systems (FS) that includes protein fractionators and fluidized sand filters. RK2 Systems is a market leader in manufacturing different types of filtration systems for large marine tanks and public aquariums. All these criteria are tested on a weekly basis with effective follow up and corrective measures in the case of slightest deviation. Weekly cleaning routine, including complete water replacement is also strictly followed by our alert and responsible staff. Apart from the contamination due to waste and rotting organic substrate, the aquarium water is always prone to the airborne pathogens. Therefore, it is essential to employ a regular and thorough cleaning mechanism. The entire California marine facility is equipped with one of the best water disinfection systems � the UV Light Disinfection System. This extremely quick and highly efficient technology is equally safe. The UV light disinfection is a purely physical process without the use of any harmful chemical-based disinfectants. The UV light emitted from the equipment directly affects the microbes in such a way that they lose their reproduction capability and are eliminated. UV rays have been proved effective in removing trace chemical contaminants also. It can be risky to introduce new livestock directly into the active tanks as they may have different behaviors and may need special care or prior familiarization to the new environment. To accomplish the task of acclimation and examination of new animals and corals, quarantine tanks are used. These tanks also prevent accidental introduction of pests or infections along with the newcomers, in the tank. 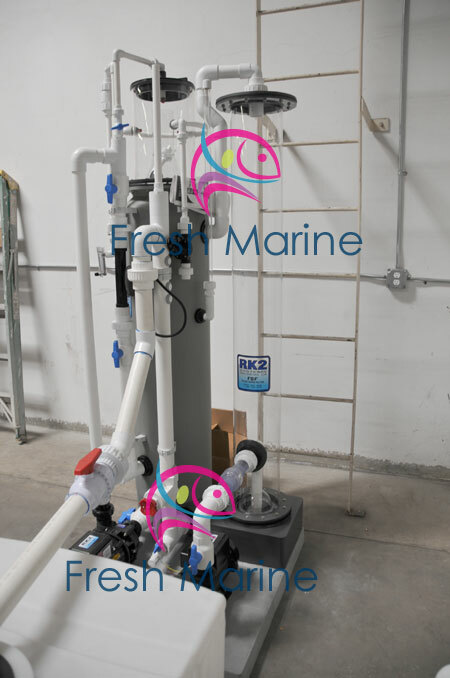 The California-based facility of FreshMarine.com has well functioning quarantine systems, optimum arrangements for filtration, temperature regulation, and artificial lighting. The surroundings in our quarantine tanks are designed to facilitate the transition of the animals and they closely resemble the main tanks. This helps in reducing the life-threatening stress on the livestock. These tanks are treated with UV Light Disinfection and are fitted with protein skimmers & specialized filters. Through its new facility, FreshMarine is continuously striving to help you become the proud owners of happy and healthy water pets!